The news this week that Benedict XVI has named 24 new cardinals, including 20 who are under 80 and hence eligible to vote in a conclave, merits a few reflections. First, it would not seem that Benedict XVI has stacked the deck in any ideological sense. 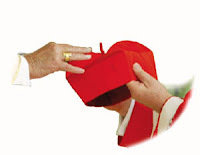 While there are no real liberals in this crop (not by the standards of secular politics, or for that matter in ecclesiastical terms), neither is the Nov. 20 consistory stuffed with arch-conservatives. In general, there’s a rough balance between traditionalists and pragmatists. The American appointments offer an example, with both the uncompromising Archbishop Raymond Burke and the centrist Archbishop Donald Wuerl. If Benedict’s aim had been to fill the College of Cardinals with the most conservative prelates available, he could have elevated Archbishop André-Joseph Léonard of Brussels, for example. In truth, Benedict seems determined to defer to tradition at almost every turn, rather than placing his own personal stamp on the college. He sticks close to the ceiling of 120 voting-age cardinals established by Pope Paul VI (while John Paul II sometimes ignored it); he won’t break with custom by naming a new cardinal before his predecessor turns 80 (that’s why Archbishops Timothy Dolan of New York and Vincent Nichols of Westminster, as well as Léonard and several others, were not on the list); and he insists on giving the red hat to all those Vatican officials who have traditionally held it. Second, Benedict is continuing what some analysts have described as the “re-Italianization” of the church’s senior government, with ten of the 24 new cardinals, and eight of the 20 electors, being Italians. Some wags in the Vatican press corps have dubbed the Nov. 20 consistory the “revenge of the Italians” because it brings the Italian share of the electors up from 17 percent to 20 -- or one-fifth of the total. Third, and related to the point above, ten of the 20 new cardinal-electors are Vatican officials, which will bring the total of Vatican officials among voting-age cardinals to 40 -- representing one-third of the total electorate for the next pope. Fourth, while there are a few obvious efforts to recognize the church outside the West -- elevating a Coptic patriarch from Egypt, for example, as well as four Africans -- in the end, only seven of the 20 new electors come from outside Europe and North America. The appointments thus extend a demographic imbalance between the church at the bottom and at the top. Two-thirds of the 1.2 billion Catholics in the world today live in the global south, but two-thirds of the cardinals are from the north. Fifth, some people may ask whether these appointments say anything about the church’s response to the sexual abuse crisis. The basic answer is “no,” in the sense that most of these new cardinals don’t have a high profile on the issue. Had Benedict wanted to send a clear signal on that front, he could have tapped Archbishop Diarmuid Martin of Dublin, just ahead of the coming visitation in Ireland. Martin is widely seen as a point person for an aggressive response to the crisis. Instead, Benedict again deferred to tradition -- Ireland is a small country that already has a cardinal under 80 in Sean Brady of Armagh. Sixth, there also doesn’t seem to be burning concern with a perceived PR problem at the senior levels of the church. At least in the English-speaking world, the best natural communicators in the queue -- Martin of Ireland, Dolan of New York, and Archbishop Thomas Collins of Toronto -- have to wait for another day. In general, one could analyze the Nov. 20 consistory largely as a “business as usual” set of appointments. This remains a teaching pontificate, premised on what I’ve called Affirmative Orthodoxy -- presenting classic Christian doctrine in the most positive terms possible. Benedict simply is not much interested in governance and thus tends to stick to the script on matters such as who becomes a cardinal -- which, in this case, translates into a bumper crop of Italians and church bureaucrats. Whether that’s a commendably evangelical focus on the heart of the Christian message, or self-defeating indifference to a “crisis of governance” under this pontificate -- or, perhaps, both -- rests in the eye of the beholder. Handicappers tend to scrutinize a consistory with one key question in mind: Is there a new papabile in the bunch, i.e., a strong candidate to become the next pope? The consensus answer this time around is “yes,” and it’s Italian Archbishop Gianfranco Ravasi, President of the Pontifical Council for Culture. Here’s a piece I did on Ravasi from February, laying out why many people find him so impressive: A prelate with the mind of Ratzinger and the heart of Roncalli. The sound-bite version is this: Ravasi is a prelate with the mind of Ratzinger and the heart of Roncalli. At his best, he blends the intellectual acumen of Benedict XVI and the pastoral heart of John XXIII.